Most of the more than a quarter of a million women who will be diagnosed with breast cancer in the U.S. each year will be married, or have a man who will fill the gap as a support partner from diagnosis, to treatment, and beyond. Husbands Guide to Breast Cancer is a reference guide for men who are looking for an easy-to-understand and practical resource for every stage of the journey. 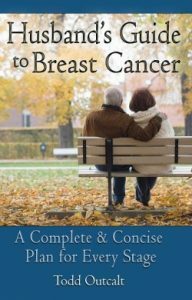 This book provides help at a glance for those who need solutions in a hurry but is also complete enough to deepen a mans understanding of breast cancer and inspire his role as caregiver. Filled with first-person accounts from real men who have walked the walk, as well as quick tips in each chapter, this book speaks to the practical side of a mans care and reveals how he can use his strengths to help the woman he loves. United Methodist church pastor Outcalt (Your Beautiful Wedding on Any Budget) covers a perspective often overlooked in breast cancer narratives and reference works: that of the husband (or partner). Outcalt the pastor has discussed cancer diagnoses with congregants and their families, but Outcalt the husband has also been there for his wife during her treatment. 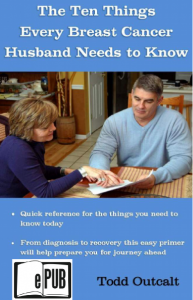 He chronicles the basic time line of treatment similarly to most other books on the subject but makes it clear that husbands are deeply involved as supporters and caregivers and how they feel is equally important. 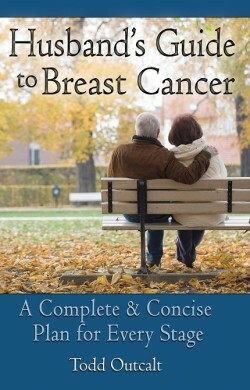 Would pair well with John Anderson’s Stand by Her: A Breast Cancer Guide for Men.